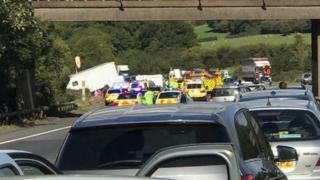 At least four people have died in a crash on the M5, police have said. Emergency services were called just after 14:30 BST to junctions 15 and 14 in south Gloucestershire to a collision involving several vehicles including a lorry. The motorway is closed in both directions and Avon and Somerset Police said it would be shut “for a considerable amount of time”. The force asked drivers to avoid the area. Highways England warned of “long delays” and said there was a six-mile queue northbound between junction 18 for Avonmouth and 16 for Almondsbury. A number of diversions are in place. Cardiologist Dr Amer Hamed was in a car travelling “10 to 20 seconds behind” when the crash happened. He was one of the first at the scene along with a passing GP and other medics to help an injured woman who was in one of the cars. Paramedics arrived on the scene about six minutes later and the woman Dr Hamed had been helping was taken away by ambulance to hospital. He said motorists who had been stuck on the carriageway for several hours already were being “very helpful”. “People are helping as much as they can,” he said. Highways England said the “early expectation” is that the M5 “will remain closed in both directions late into this evening”. It added drivers on the M4 planning to join the M5 northbound were unable to do so.